Today’s recipe was inspired by The Leavening Agent who posted a great photo of a blueberry bar. She didn’t include the recipe, so I checked a few bulletin boards and found the original version which was originally published in Fine Cooking Magazine. It had mixed reviews and some specific criticisms including “too much crust, not enough filling”. So I decided to make the bars using a different recipe for crust and topping. The results were fabulous and I am having a hard time staying away from these bars! They are very lemony (don’t leave out the zest! ), sturdy, but still creamy and smooth. If you like the lemon-blueberry combo, this is a must-try recipe. Let the bars cool in the pan on a rack until just warm, about an hour. When cool, transfer to refrigerator to chill for at least 2 hours. The longer the chill time, the better they’ll be. These remind me of the Lemon-Oat Squares from King Arthur Flour Whole Grain Baking, except they use whole wheat flour in the crust and don’t have blueberries. I just LOVE those – there’s something so very very delicious about a lemon and condensed milk filling and oats! So, I’m making a note to try adding some blueberries next time – that sounds great! I made these for my son’s birthday – he doesn’t like cake. They were gone in a blink! Thank you so much! This was extremely tasty . Made a tray and they vanished before my eyes. Had good reviews by everyone who ate them at home. This was one of the best crumbles that I have eaten. Will try it with raspberries next time. Thanks for the suggestion. I’ll see if I can make the recipe printer friendly. A lot of the more recent recipes are printer friendly, but some of the older ones (like this, apparently) aren’t. Forgot to say, just wish there were printer-friendly page. It printed your whole blog post instead of just the recipe. These are amazing! Thank you so much for the recipe! Fantastic! Definitely great with the pecans on top. Also the step with baking for 7 minutes with the lemon mixture before baking it with the topping can be left out. It doesn’t seem to make any difference to how they turn out, I tried it both ways. I had everything in the house to make these except fresh blueberries – but I had fresh strawberries, so I tried half a batch with those. Oh my! So delicious! I am calling them “Strawberries and Cream Bars.” Going to make another half batch to use up my condensed milk. Thanks for another winner, Anna! I too just have to tell you that I bake ALL THE TIME–hands down this recipe is the most requested and is responsible for bringing many new readers to your blog. Thank you, as always, for taking the time to share so much with all of us. Those bars are great, aren’t they? I think they’re one of the most popular cookies on the blog. Thanks so much for following Cookie Madness and for trying some of the recipes here. Have fun with those wild blueberries! Hi Anna, I am currently eating these and they are GORGEOUS!! A perfect dessert for the hot, sunny summer day we are having here in Ontario, Canada. I have become a bit obsessed with your blog lately and just since I stumbled on it, a couple months ago, I have made dozens and dozens of your recipes. The wild blueberries are just coming out here, so I will be trying more of your blueberry recipes. I need a small pie plate like yours though, so I can test a few different pies! Lucie, sorry you forgot the flour but I’m glad it all worked out. I hope you try the recipe again :). Definitely try some more recipes. Email me if you’d like some suggestions. Maybe I can help since you like the lemon blueberry combo. I have tried the recipe from Fine Cooking’s Magazine and agree that there was too much crust for the filling, however I really like the blueberry/lemon combo (especially for spring) so I was going to make them for Easter. I was searching for the recipe on my phone at the grocery store but stumbled upon yours instead. As I took them out of the oven I thought they were looking a bit thinner than the ones in your picture… needless to say thanks to phone technology I added 3/4 cup of flour instead 1 3/4 cups… oops!! Either way though they turned out delicious, and their thinness may be why I had some trouble getting them out of the pan in one piece; they kept falling apart. Some people just spooned them out of the pan and threw some vanilla ice cream on top! Over all they were a huge hit! I’ll have to check out your other recipes! Thanks! Will do that… THANK’S ANNA! Alie, the trick it to line the pan with either parchment paper or non-stick foil. If you can’t find (or don’t want to buy) either of those things, just line the pan with regular foil and spray the foil with cooking spray or brush it with melted butter. If you line the pan, you’ll be able to lift the bars out of the pan and they’ll be easier to cut. Thank you! I am honored that this recipe is in your notebook :). Hello! I’m from Chile, I’m 20 years old and I love your website. Sorry if my english have mistakes, hahaha. I’ve try some recipies and all of them have been a HIT! I love so much cooking, but a don´t have so many time to cook. And at my house, most of the time we try to cook healthy things. But as soon as I saw this recipe, I knew that it will be perfect for my Birthday’s tea. Everybody love them!!! I have a notebook where a write every recipe that sorprise me or that ones that you don´t want to miss or forget (as my mothers muffins, makes me remember my childhood). This recipe definitely won a place in my notebook! Oh-so YUMMY! I added a heaping half teaspoon of cinnamon to the flour/sugar/oats/butter mixture. I thought it’d enhance the flavors. IMHO, it did. Thanks so much for sharing! Ok, These are in the oven as I write! I used a mini-food prep. on the oats and added some hazelnuts. For the butter I just worked it into the flour mixture with my fingertips till it became nice and sandy. I also added raspberries. 🙂 So far it smells wonderful. Thanks for the recipe Anna. Just made these with orange and cranberry instead of lemon/blueberry and they are fabulous! I’d go with the larger one. Wow! These are something I must try. I have a tiny processor and I need to buy a larger one. Which size would you suggest for basic recipes, a 7-inch or a 9-inch? You definitely do not need a food processor, but there’s a cheaper tool for the job. It’s called a pastry cutter and it should cost you about $8.00 at your local cooking store. Pampered Chef also makes a really nice one too. A pastry cutter is a handle attached to a row of little blades which you use to cut the butter into pieces using an up and down/slightly tilted motion. You could do the same thing with two forks, but it would take a lot longer and be kind of a pain. I think a hand held mixer would knock the butter and flour around too much as opposed to cutting the butter into the flour. So I guess my overall recommendation is buy a pastry cutter. You’ll find it very useful and it’s almost a necessity if you plan to make pie crusts or biscuits. I’m feel like tempting my beginners luck and trying to make these lemon bars. As stated above, Fine Cooking’s recipe is different. I had intended to make Fine Cooking’s recipe, but after reading reviews on another food bulletin board, I changed the recipe quite a bit. If you take a look at this board, you can see where someone posted FC’s recipe verbatim and what others had to say. I’m glad you enjoy Fine Cooking’s version. Maybe you could try this one and compare the two. They are different ;). this recipe is from the fine cooking magazine. I have made them several times and yes they are addictive and delicious. Those bars look sinfully delicious! Yum. I made these too! Sugar High Friday last month. They were absolutely delicious–definitely worthy of a Top Ten. I made these earlier today, and they are absolutely delectable! Making them was so simple; I followed the directions exactly. I didn’t even have any trouble with them sticking to the bottom (for greasing the pan, I used a pastry brush to brush the bottom and sides with a little melted butter). It’s so nice to find a dessert with a few healthful ingredients too (and man oh man are those blueberries delicious)! I made these for my book club meeting yesterday and everyone really liked them. One of my non-cooking friends even asked for the recipe. I would definitely recommend lining the plan with foil or with parchment paper. They weren’t impossible to remove from the pan, but they would have been a lot easier to cut out of the pan. Additionally, I cooked these the night before and was worried the blueberries would bleed or the crumb topping would get soggy, but they didn’t and were wonderful. Oh, Anna, these could easily become favorites of mine! Ohh yum! These look fantastic. Blueberry and lemon are the perfect combo. And I just found what I’ll be making next. 🙂 But maybe a lime/raspberry combination. I think it would work okay, right? Oh, yeh, the perfect summer dessert. I have a sweet mom who will love these. What a great summer blend of two wonderful ingredients. Never go wrong with lemons and blueberries separately but putting them together like this takes them to a whole new level!! MMMMMM good!! Oh my, those look VERY good. This is one I need to try for sure! I can’t wait until the fruit starts to roll into the farmers market. With all the flooding and the very cool spring, everything is a few weeks behind up here in Minnesota. I have a few blueberry recipes that I am eager to try. One is Camilla’s Texas Blueberry BBQ sauce and this one for sure. I actually didn’t even read the recipe and thought they were cream cheesy. It wasn’t until I read someone’s comment about trying it that I realized it was condensed milk. Looks yummy! Substitute for condensed milk? I think some sort of sour cream/sugar/berry combination would work. Maybe something similar to the filling in the sour cream blueberry pie? About the frozen fruit, I’m not sure that would work so well. It might add to much moisture and cause runniness. You could try it, though! The dough/topping is almost identical to the one for jam bars, but I used 2 kinds of sugar. You should give some to Lizzie, since they don’t have chocolate–my pooch who normally won’t eat fruit or veggies once inhaled a blueberry cream tart in seconds flat, much to my surprise. I don’t know if this is an appropriate space to comment, but your no-fail bars were gooey and great–next time I may try Reeces Pieces instead of semisweet chocolate chips. I’m moving onto the small batch vegan peanut butter cookies, but I only have almond butter in the house, so I may see if it works with that instead. Lemon and blueberry is probably my favorite fruit combination and something I’ll actually stray away from chocolate for. These look irresistible. I like how you add oats to your crust mixture! Ooo, yummy. I don’t even like lemon in most things, but I’d be tempted to try these to feed to a group. And just in time for blueberry season in Michigan! I wonder if cream cheese could be incorporated into these somehow . . . I needed a pan of bars to take to worship on Sunday, and the lemon blueberry combo is one of my favorites. It says “summer” which is precisely the thing I was going for … thanks! Oh these look terrific! I love fruit/oat bars. 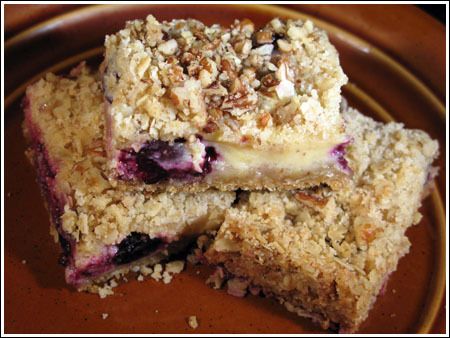 And I was thinking about trying your recent jam/oat bar (that I am still eating, by the way) with a blueberry/lemon filling. So this is even better. I may wait to try them until our local blueberries arrive at the farmers market, they are absolutely wonderful and I am always looking for a reason to buy more during their short season. This will be great! These look delicious! I think I may have to make a little treat this weekend. I agree with the others — they look awsome and delicious. I will probable eat the whole pan myself, too. I also have blackberries and red raspberries in the freezer. Think they would work here? These look so moreish – I don’t think I’d be able to stay away from them! Any substitutes for sweetened condensed milk? Looks delicious! Funny — I just made these this past weekend for a bake sale at hubby’s work. Reports of popularity — but I didn’t get to try any myself. Guess I’ll have to make another batch these weekend for us! (maybe a 1/2 batch in 8″ or 9″ pan). Yum! These sound awesome. I’ve got some blueberries that I need to use up, so I think I’ll give these a try. Plus, I’ll look for any excuse to use my new lemon juicer doohickey! I don’t blame you for not being able to get enough of those bars – they look so luscious!